Recently, I was invited to participate in Project PB&J, a recipe round up, with other food bloggers for National Peanut Butter and Jelly Day. Peanut butter and jelly are a staple in our home so I was excited to participate and join the fun. I immediately thought about what I might create and found myself coming up with all sorts of ideas. I also remembered a less successful PB&J creation I made as a child. Since I was the oldest of six kids in my family, it was often my job to make all of my younger sisters and brother something for lunch – particularly during the summer when we were out of school. The most common lunch: peanut butter sandwiches. One day, knowing how tired I was of our usual, I decided to get a bit creative. I pulled out the Kraft Parmesan Cheese and gave our sandwiches a sprinkle of cheesy goodness. I served my brother and sisters and waited for the reaction — somehow thinking they would all shower me with affection for trying something new. Unfortunately, my idea didn’t go as planned. They questioned the ingredient, promptly told my mom, and I was sternly warned to never do such a thing again. While I’m sure none of you would tattle on me to my mom if I shared my peanut butter and jelly and Parmesan cheese sandwiches with you, I thought it was best to go a different route. 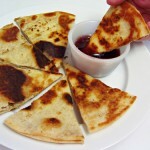 Today I’m sharing one of Mattie’s favorites: Peanut Butter Quesadillas with Grape Jelly Dipping Sauce. It’s very easy, a total kid favorite, and features no cheese like traditional quesadillas (or the less traditional peanut butter and Parmesan Cheese, circa 1984). You will need two flour tortillas, peanut butter, butter, and your favorite jelly. Spread one of your tortillas with the peanut butter. I usually keep it away from the edges a bit, since the peanut butter does melt and usually work it’s way to the edge anyway. In a large frying pan, melt about 1 tablespoon of butter over medium heat. 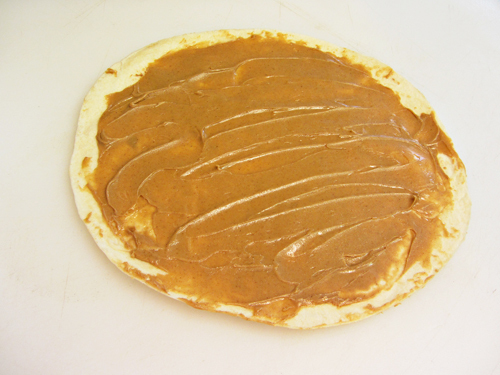 Place your peanut butter’ed tortilla down on top of the melted butter, with the peanut butter side facing up. Then place the other tortilla directly on top of the peanut butter. Cook until golden brown on the first side and then flip over to cook the other side. When the second side is golden brown, remove from the pan and place on a plate. Using a pizza cutter (or knife), cut the quesadilla into wedges. In a small saucepan, place the grape jelly. Heat the jelly over low heat, stirring constantly until smooth and no lumps remain. 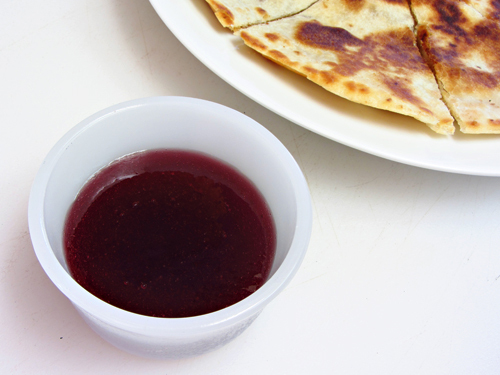 Pour the grape jelly dipping sauce into a small cup. 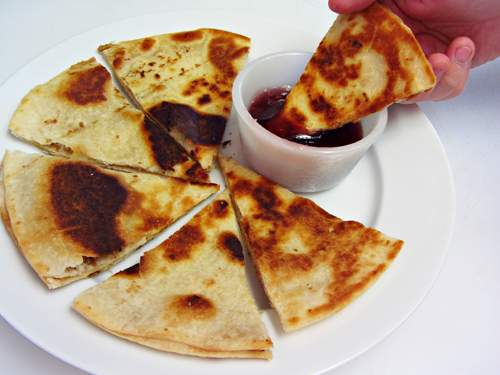 Dip your peanut butter quesadillas into the grape jelly dipping sauce and ENJOY! There is lots of variations of these. You could use Nutella, instead of or in addition to, peanut butter. You could also add sliced bananas on top of the peanut butter. You also don’t have to use grape jelly — feel free to use your favorite jelly or jam. 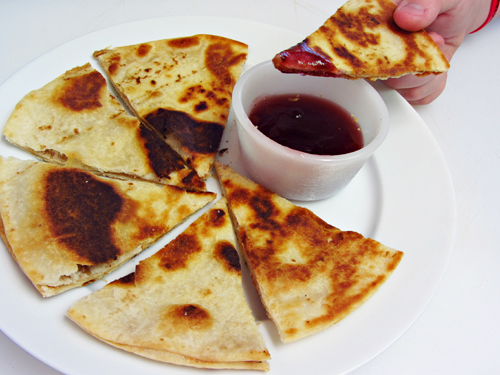 You could even spread grape jelly INSIDE of your quesadilla with the peanut butter and skip the sauce part. 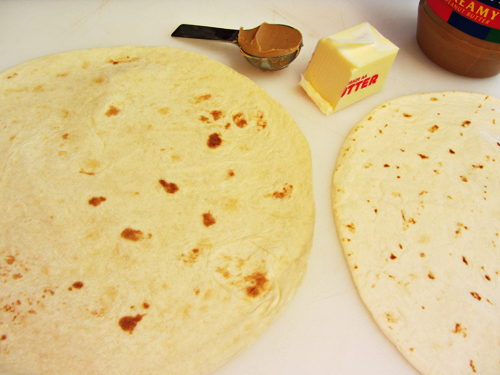 Spread peanut butter on one side of one of the tortillas, keeping peanut butter away from edge a bit. Over medium heat, melt butter in a large frying pan. Place the tortilla that you have peanut butter on into the frying pan, peanut butter side facing upwards. Top the peanut butter with the other flour tortilla. Cook in pan until the first side is golden brown (approx 3 minutes). 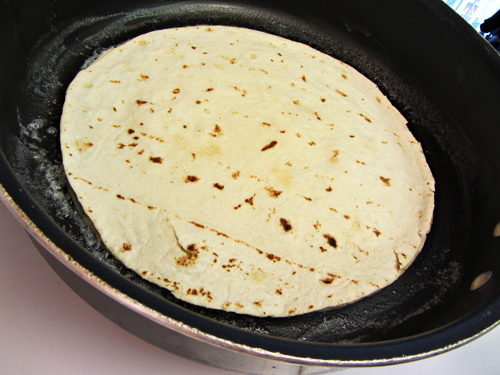 Flip tortillas to cook the other side until golden brown. When finished, remove from pan and place on a large dinner plate. Using a pizza cutter or knife, cut quesadilla into wedges. 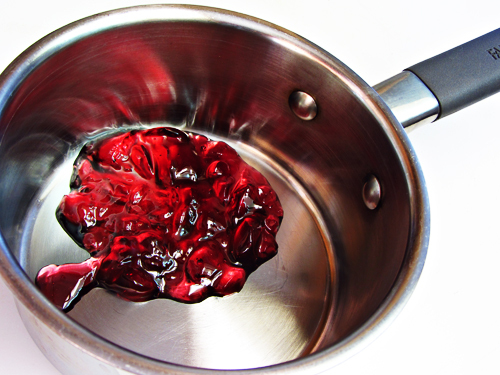 Place grape jelly in a small saucepan. Heat over low heat, stirring constantly until jelly is smooth and no lumps remain. Remove from heat and pour into a small serving cup. 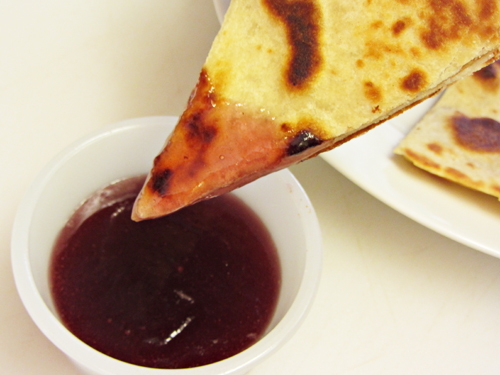 Dip quesadilla wedges into grape dipping sauce and enjoy. 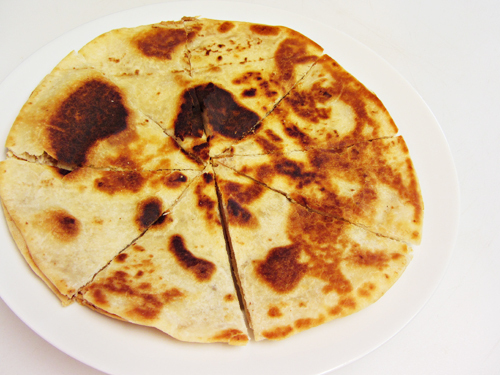 I’d love to hear what you would put in your peanut butter quesadilla, so leave me a comment and share your idea! 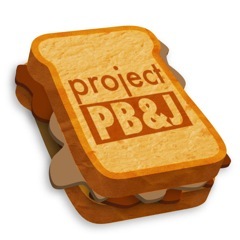 For more great PB&J recipes, be sure to check out Project PB&J. There are lots of great recipes there that will be a perfect way for you to celebrate National Peanut Butter and Jelly Day on April 2, 2012.